Sesame Street’s Cookie Monster is getting ready for The Furchester Hotel, a new UK TV series that just started airing this fall. Sometimes, Cookie Monster works at the hotel, and he recently spoke to Brit John Oliver about the differences between the UK and the American street he generally lives on. You can check out the amusing video, below. Things seems to be going pretty well for Cookie Monster. He seems pretty excited about The Furchester Hotel, where he will work as a waiter, and he has enlisted the help of Last Week Tonight host John Oliver to help him get acclimated with the differences in vocabulary on both sides of the pond. 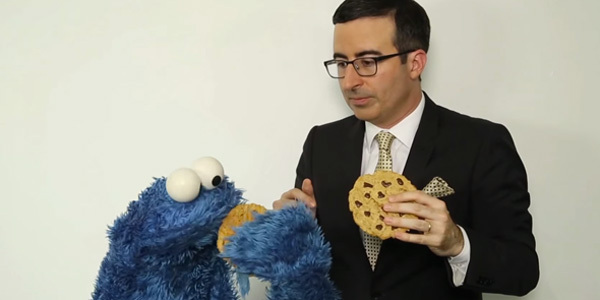 Early in the video, John Oliver explains to Cookie Monster that people will say “hello” and “goodbye” in generally the same fashion as they do at home. However, then disaster strikes. As Oliver and Cookie Monster talk about differences between the two countries, the HBO news anchor accidentally calls Cookie Monster the Biscuit Monster, totally shattering his ideas about the world. The muppet totally freaks out, screeching, “Oh no” before launching into a tirade about how he knew things would be different in the UK. He’s about to have a full-blown panic attack when Oliver produces a biscuit, which the muppet is smart enough to realize has the same shape, size, taste and texture as the cookies he knows and loves. All is well that ends well. The two make it out of the sketch as buddies, and Cookie Monster even gives Oliver a “little tea/ little t” to go along with his biscuit. Cookie’s also learned a valuable cultural lesson in the sketch, and is ready to head to The Furchester Hotel. Hopefully, there won’t be too many other language surprises when he gets there. Just wait until he hears about jumpers and chips. You can catch all of The Furchester hotel episodes with your kids when they hit Sesame Street’s Youtube channel every Friday. Or, if you are super in a Cookie Monster mood now that you’ve caught this video, you can watch the character read cute tweets on Jimmy Fallon’s show or catch the hilarious “Call me Maybe” spoof with Cookie Monster called “Share it Maybe.” Cookie Monster, if anything, is always entertaining.